My name is Laura and I want to tell you my story. My pony Zola died on the 5th January 2012 of equine grass sickness. She was my first pony and my best friend. 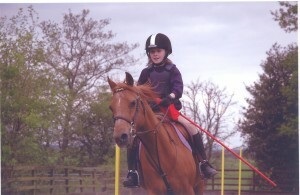 Zola had been a favourite pony throughout the Strathblane and District Pony Club. Everyone knew her. She was a competitive pony with a bit of an attitude, but very lovable. Over the years she became one of the family and would never be sold, we would have kept her forever. Approximately three weeks before she was put down the symptoms had begun with severe colic. We called the vet out to check her over, but all she wanted to do was lie down and kick frantically. My mum walked her round in circles in the stable to keep her on her feet. It seemed like forever for the vet to come. The vet was very anxious for Zola, but didn’t want to concern us. As time went by Zola deteriorated in front of our eyes. I was losing my best friend. We tried everything from hard feeding to foals colostrum to help her digestion, to having a small radio in the stable to keep her company over the long hours of the day. After a while I could see there was no change in her appearance, but we kept our hopes up. Christmas passed by and still there was no visual improvement. If anything she was rapidly deteriorating. Once again my Mum called the vet out to check up on Zola. I could tell my Mum and Gran were more emotional than usual. The vet came into the table and straight away made his decision. He turned to my Mum, Gran and I and gave us the devastating news. Huge thanks go to Laura and her family, who raised valuable funds for grass sickness research at Killearn Farmers Market in October 2012. They took an unprecedented four tables at the market, where they sold lovingly prepared home baking, pin cushions, plants and held a raffle with fabulous prizes. In all they raised over £600 – a superb effort!